Remember today? Today, May 16th, 2015, is your college graduation. There’s a lot of emotions swirling in your mind right now – fear, joy and a bit of uncomfortableness as you’re writing this letter to yourself. Really, it’s weird. But that’s not what I want to talk to you about, the weirdness I mean. Graduation. This is huge. It’s been five and a half years in the making to get to this point. I know looking back I don’t remember the first day of college, so I’m sure you still don’t. But remember how you got your license two days before starting community college? That was definitely a blessing from God that you didn’t fail that test. Otherwise not only would you have been stuck not being able to get to class, but Vicky wouldn’t have either. Speaking of Vicky, she’s graduating today too… well, you know, you were there (or here?). I think it’s amazing that you and Vicky not only started community college together, but you also transferred to the same state university and graduated from there together. Even though after Northwestern you two didn’t get to see each other as much, especially due to your time at Liberty, you and Vicky still remained close. I hope you’re still as close, whenever you’re reading this. I don’t know where you’re working at the moment, but I hope it’s a job you love. Maybe it’s even one of the jobs I applied to this past week, or maybe it’s completely different. Again, I guess it depends on when you’re reading this. Things change, a lot. But what I want to get across in this letter to my future-self is that, well, everything is going to be okay. 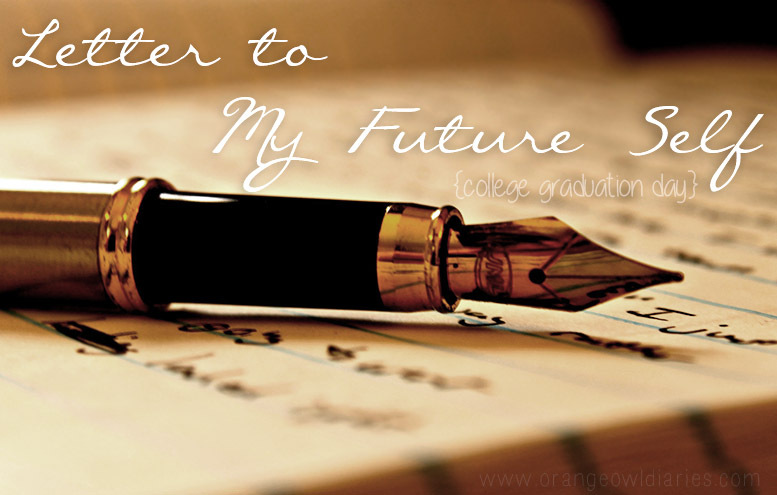 I know you know that, you are my future-self after all, but even if you’re going through a rough period while you’re reading this letter… it’s going to work out. God’s always with you and whatever you’re going through right now is just a way of getting closer to Him and making you a stronger child of God. I mean, remember yesterday when you were upset about not getting that videographer job at the hospital? I’m sure you know now exactly why that job wasn’t good for you, or maybe you never found out but don’t care because the job you have now is that much better. I hope you’re doing good and that you’re still blogging… otherwise this is just awkward.